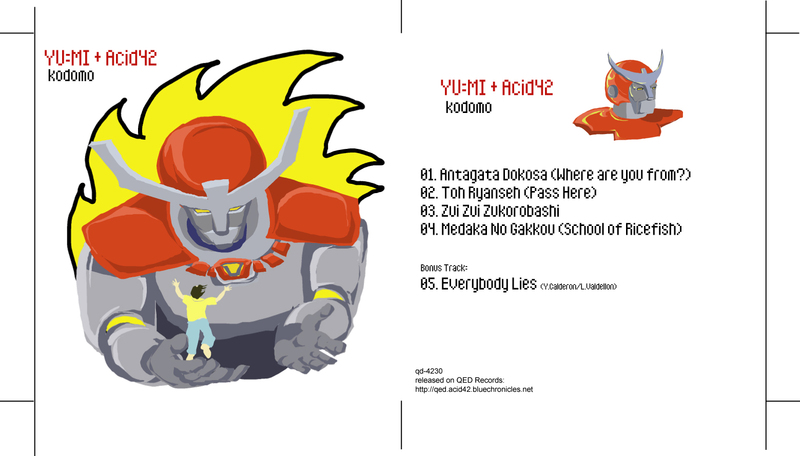 Think of bouncing balls, building blocks, and nursery rhymes, and what you get is KODOMO (which in Japanese means “child”) — a collection of 4 traditional Japanese children’s songs, given a funky new synthpop and ethnotronica spin by Japanese-Filipino vocalist YU:MI Calderon and musician Acid42 (Lionel Valdellon). The bonus 5th song “Everybody Lies”, however, is a synthpop song tackling the darker side of relationships and is written by the collaborating duo. FILE UNDER: world, ethnic, ethnotronica, electronica, synthpop, electropop, folktronica, Japanese folk songs, kiddiesynthpop, J-Folk, more playful than Rainbow Brite and He-Man. Full lyrics and english translation + individual file downloads after the jump. 01. Antagata Dokosa (Where are you from?) is a children’s play song sung to the rhythm of a bouncing ball. 02. Toh Ryanseh (Pass Here) is a folk song, which was used by the Japanese government as a WALK signal for pedestrian crossings. 03. Zui Zui Zukorobashi is a nonsense nursery rhyme about a little rat eating rice. 04. Medaka No Gakkou (School of Ricefish) is a song about a school of fish, literally with students and teacher, and the graceful way they all swim in the water. 05. Everybody Lies is about the erosion of relationships when trust breaks down. In Semba mountain there is a raccoon. Hide it a little with a leaf from the tree. Go ahead, pass here, pass here. Which narrow path is this? This is the narrow path going to the god of the shrine. Can I pass this way? Those who do not have a reason to go will not be allowed to pass. I’m going to offer a good luck charm to celebrate this child’s 7th birthday. Its easy to go there but it will be scary going home. It is scary but pass here, pass here. Even if daddy calls, even if mommy calls, no one’s coming. Who broke the rice bowl around the well? Which are the teachers and which are the students? Maybe I should have built more walls. CHORUS: Everybody lies, Lies about something. Who can I believe, But myself? 2. Somehow I hold the cards, I found out everything. I could tell her what’s going on. Tell her how he betrayed her, Tell her how he came to me. I can foresee how things will go wrong. 3. I never think of him. I’ve rid myself of him. I’m even lying to myself. Maybe the time has come to move on. Enjoy ako dito sa Kodomo. The picture seems to be at your house in Markina. ;) Thanks. I tested it out in the latest version of Safari and saw no problems.